The Apollo missions inspired a generation, but was humanity running before it could walk? This story was updated at 11:20 a.m. EST. Plansfor human exploration of the solar system and beyond often polarize opinionsamong the public and scientific communities. Somebelieve that humanity shouldprogress outwards one stage at a time, while others insist that greaterscientific returns are to be had by launching bolder missions, with humansexploring the planets sooner rather than later. Dr. Kai Multhaup, a physicistworking at the Westf?lischeWilhelms-Universit?t M?nster in Germany, is firmly in the ?one step at a time?camp, as he recently explained at Europlanet?s Planetary Science Congress. It is aserious dilemma that faces space exploration policy makers: establish afoothold in low-Earth orbit and plan new manned missions to the moon, or concentrateon robotic exploration of planets such as Mars? Multhaup?s stance is clear: ?We were cave dwellers,and now office dwellers. The next step is for us to become solar systemdwellers.? He believes that humans must progress into space, not only toadvance science but to appeal to our natural sense of adventure and,ultimately, to ensure the survival of our species. ?Humanspaceflight is not just about science,? says Multhaup. ?I see it as a driverfor evolution. We are an exploratory species, and when we have the technologyto go somewhere, we do. It?s about culture and the human desire to evolve andexpand, and to protectourselves against catastrophes which can erase life on planets and endcivilizations.? Hebelieves that there is much to be learned from prolonged manned missions to themoon, and the experience is necessary before successful ventures to moredistant worlds such as Mars. ?The space shuttle and station are oftencriticised,? he says. ?They have their flaws, but they are important. You can?ttake the shuttle to the moon or attach an engine to the International SpaceStation and send it to Mars, because they aren?t designed to explore. They aremeant to operate in low-Earth orbit, and teach us how to live and work there.? Todate, the majority of solar system exploration has been conductedby machines. Multhaup acknowledges their value, especially when probingworlds far too distant to send humans with our current technology. But, ?robotscan only do so much,? he says. ?They have been a great success, but there aremillions of programmers working for many hours just for them to roll half ameter and take a look at something. If you send a geologist to Mars you coulddo a whole lot more in a shorter period of time.? Thenthere is the issue of inspiring the public. Taxpayer money funds spacemissions, and while robotic probes raise interest, nothing captures theimagination quite like human exploration. Previousmissions to our natural satellite certainly achieved that, but Multhaup thinkswe over-reached. 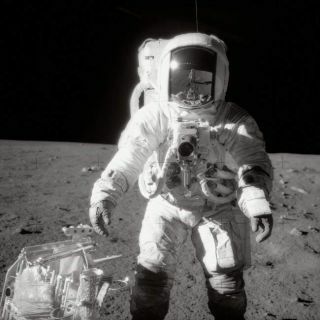 ?A lot of people were inspired by the Apollo missions to the moon,and of course it was a great thing,? says Multhaup. ?But it was like taking thesecond step way ahead of the first.? He thinks that by rushing to the moonwithout establishing a long-term presence in low-Earth orbit, it was inevitablethat the momentum to send humans to explore space fizzled out. Sowhat does Multhaup think would be a sensibleexploration plan? He says it is important to continue a presence in Earthorbit using constructions like space stations. The next step is to establish moonbases, which will eventually become permanent human colonies. Next would be agrand mission to Mars, during which the first human steps will be taken on aplanet other than our own. After this should come intensive investigation of theasteroid belt and possibly mining operations to provide resources for basesbuilt progressively farther out. Finally, we would move on to the icy moons ofgas giants like Saturn. Ice is likely to be very useful if not essential forhuman existence far beyond our home planet, and moonssuch as Enceladus could turn out to be like oases in a desert. Multhaupis keen to stress that this strategy would almost certainly take centuries toimplement. But by taking things one step at time in a measured approach, hethinks momentum will be built up and future progress will be steady. Ofcourse, Multhaup?s opinion is just one among many. Some believe that the bestapproach to the exploration of space is to always send robots rather thanhumans, while others think we should look beyond low Earth orbit and lunarsettlements, and instead focus all our efforts on sending humans to Mars. Debateabout the direction solar system exploration should take is often fierce, and thereare countless factors to be taken into account, including the scientific value ofmissions and the political support for them. Discussing the issues and weighingthe pros and cons of different approaches today will eventually determine ourfuture in space.